You need to safely secure your car in an elevated position in order to access to the underside. This can be accomplished several different ways. The most important thing is that it is always carried out in a safe manner. It is also important that you never short cut safety. If you are uncomfortable doing this please seek professional help or the help of an experienced friend. Rhino ramps are another way to get your car in the air. It just isn't as much fun as the lift. Our 2008 GS 350 is safely secured in the air on a four post lift. I like to open the oil filler cap enabling an air vent. This helps ensure that all the oil drains out and drains and fast as possible. Not a necessary step but highly recommended. 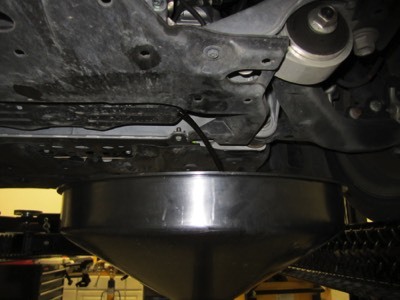 If you are using a lift to perform your oil change, be sure you complete this step before lifting your car into the air. 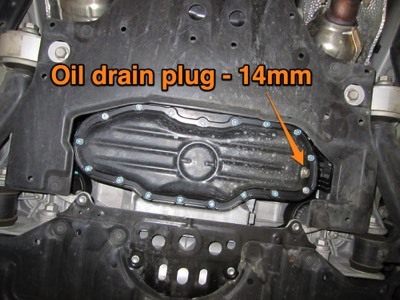 The oil drain plug requires a 14 mm socket / wrench to remove. I do not have a torque specification for it when tightening it back up. Don't kill it when putting it back in. I would guess 20 ft-lb would be good. 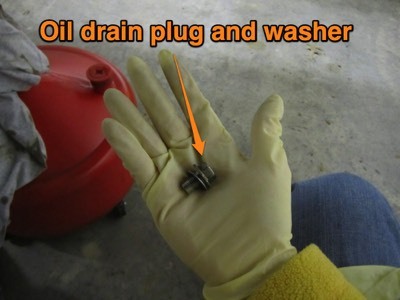 Here you can see the oil drain plug with metal washer. The oil draining into a safe oil catch container.